In the world of living US composers, George Tsontakis (b. 1951) is an integral part, apparently, though for whatever reason I have not up until now heard any of his music. That is remedied by the recent release of three concertos performed ably by the Albany Symphony and soloists under David Alan Miller (Naxos 8.559821). The works featured are Anasa (2011) for clarinet and orchestra, True Colors (2012) for trumpet and orchestra, and Unforgettable (2009 rev. 2013) for two violins and orchestra. "Anasa" with David Krakauer as the clarinet soloist begins the program on a lively note with a thoroughly klezmerized score that Krakauer dominates over with stylistic acumen and authenticity. There is much charm and dance-like immediacy. The subtle interweaving of orchestral density and overarching klezmer clarinet expressivity wins me over easily. 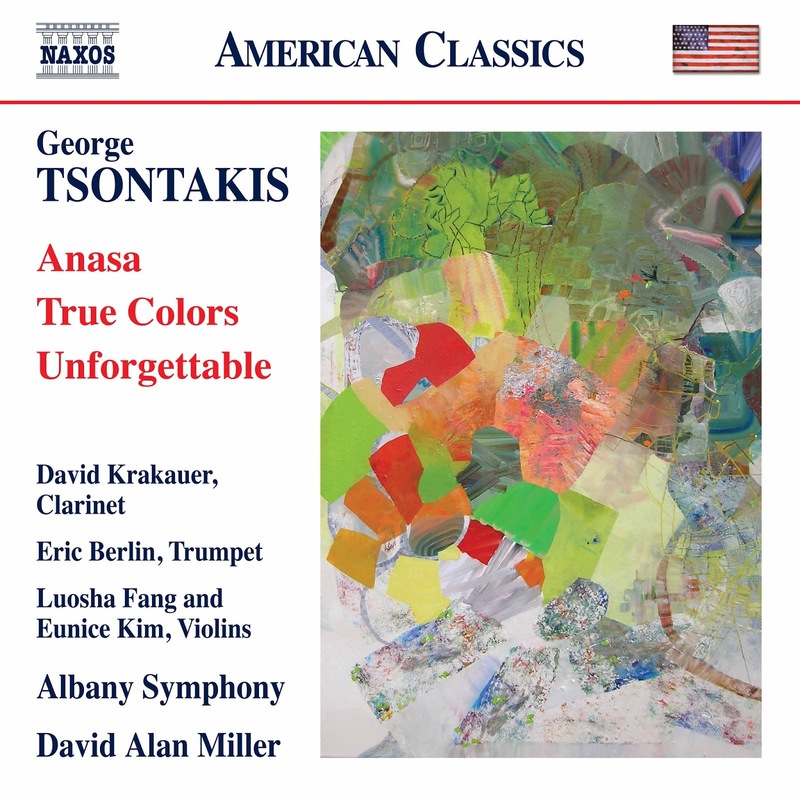 "True Colors" opens on a suspended mysterioso mood with much variation in hues from the orchestra and a more directly modern sound. Trumpetist Eric Berlin enters with surety, dexterity and a full tone. The music gathers momentum and trumpet gains a semi-jazzish stance while the orchestra explores variational or ostinato imitative motive cells and harmonically full thematics with bell-like reflective moodiness. "Unforgettable" continues and deepens the mood with a searching and probing kind of meditative modern mode that makes excellent and unexpected use of the two violin soloists (Luosha Fang and Eunice Kim), who alternate between tightly woven interactions of virtuosity and a bottom-up continuation of the melodic thrust of the orchestra. The sort of "remember me" reflectiveness has a vague resemblance in mood to Berg's "Violin Concerto" yet never trespasses directly on that concerto's set domain. It is the most moving of the three works, drawing a fitting conclusion to the program. Tsontakis brings to us a well structured middle-ground modern series of tone poems that bear up under the familiarity of repeated return aural visits. Performances are uniformly good. The three concerted works show depth, subtlety and a visceral immediacy. Tsontakis has his own voice yet fits in well with the US school of melodically lyrical-depictive composers of the past 100 years. A fine listen!